This is the Spreckels Organ Pavilion in Balboa Park in San Diego, California. With over 5000 pipes, comprising 80 ranks, the Spreckels Organ is the largest outdoor pipe organ in the world. Spanish organist Raúl Prieto Ramìrez is the new Civic Organist of the City of San Diego and Artistic Director of the Spreckels Organ Society. Tune in every Sunday at 2PM (Pacific Time) to hear our weekly concert online. 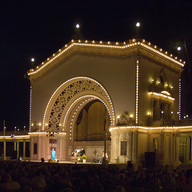 During the summer months the Spreckels Organ Society also presents the International Summer Organ Festival concerts on Monday evenings @ 7:30pm, starting this year on June 25th. CLICK ON "Follow" here and get notified when we go live.